Product #1317 | SKU CONVOPENGAAS | 0.0 (no ratings yet) Thanks for your rating! 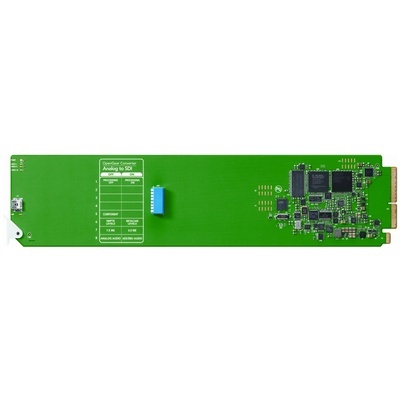 The OpenGear Convertor Analogue to SDI Module from Blackmagic Design is a component designed for use in the modular OpenGear system. OpenGear is essentially an open-standards chassis that can be mounted in a rack for conversion and processing work. The chassis accepts different modules to enhance its functionality, allowing the solution to be expanded or scaled at will. This module is designed to convert analogue HD/SD component, NTSC, PAL or S-video input to SDI output with balanced AES/EBU and analogue audio embedding. It is well suited for use with Betacam SP, VHS, set-top boxes, gaming consoles, and HDV cameras, among other possible equipment and applications. Use this module to convert analogue HD/SD component, NTSC, PAL or S-video input to SDI output with balanced AES/EBU and analogue audio embedding.